It is time for me to relax and just enjoy life with my poodles, it has been a pleasure to be a part of the poodle world, making families happy and lifelong friendships. We will continue to help poodles in need and helping rescues and rehomes find their forever homes! Welcome to O'Kaylyn Farms Standard Poodles! 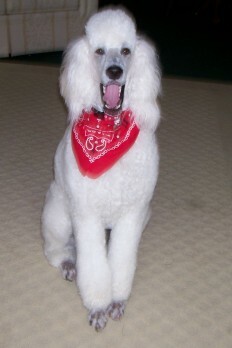 We lovingly raise AKC & UKC registered Standard Poodles. We have recently relocated from the Cleveland, Ohio area to beautiful western Pennsylvania. All our dogs live in our home--not in kennels or cages. Our puppies are raised in our living room and are handled and loved from birth. We are absolutely not a breeding farm or facility, we only produce one to two healthy, well socialized litters per year at an affordable price. Our dogs are family, we spend countless hours with each and every puppy from the time it is born until it goes to its new home. We work hard on socialization and our babies are exposed to as much of the outside world sights and sounds as possible so you have a well adjusted puppy. Our puppies are all sold on a limited registration (spay/neuter contract). They have their shots and worming up to date, are vet-checked and micro-chipped and have their first grooming before going to their new homes, we even start them on paper training to make your job easier. Each puppy is sent home with a complete puppy care kit and each home is chosen carefully. Looking for a puppy? Read thru this site it will answer many of your questions including if a Standard Poodle is the breed for you! In addition to a CD, Sabine has agility titles in Novice Standard and Novice Jumpers, and surprisingly, mostly blue ribbons for her runs! (She's perfect, just slow.) An Open Standard title would probably be doable, but I don't feel the need to push her. We have a lot of fun just playing at it, and Sabine exhausts herself between practice runs by mooching treats from other handlers! Since she was certified a Therapy Dog in 2007, we've been active in the Reading to Dogs program at the city's library branches. She's so outgoing and loves the kids. Last year we started volunteering with Agility Ability, which teams therapy dogs trained in agility with disabled kids who work with them to run a course. That's been very rewarding for me and Bean enjoys the attention. But most days our routine is to spend an hour in the big park a couple blocks from our house. Lots of off-leash space for sniffing, fetch and swimming, which is her favorite. People always smile at her poodle bounce, and we run into canine and human friends there. O’Kaylyn Farms reserves, in its sole discretion, the right to determine the best potential owner for all their animals. Any deposits received by O’Kaylyn Farms maybe refunded to prospective owners for any reason, at any time. Any such deposits received by O’Kaylyn Farms do not infer or guarantee a contractual obligation on the part of O’Kaylyn Farms to deliver an animal to prospective owner(s).